This article is about the theoretical world-ending destruction. For the professional wrestling maneuver, see Doomsday Device (wrestling). For other uses, see Doomsday machine (disambiguation). A doomsday device is a hypothetical construction—usually a weapon, or collection of weapons—which could destroy all life on a planet, particularly Earth, or destroy the planet itself, bringing "doomsday", a term used for the end of planet Earth. 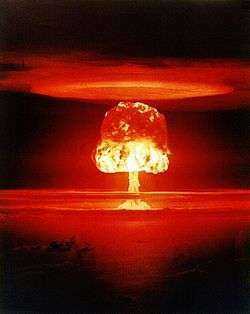 Most hypothetical constructions rely on the fact that hydrogen bombs can be made arbitrarily large assuming there are no concerns about delivering them to a target (see Teller–Ulam design) or that they can be "salted" with materials designed to create long-lasting and hazardous fallout (e.g., a cobalt bomb). Doomsday devices and the nuclear holocaust they bring about have been present in literature and art especially in the 20th century, when advances in science and technology made world destruction (or at least the eradication of all human life) a credible scenario. Many classics in the genre of science fiction take up the theme in this respect. Since the 1954 Castle Bravo thermonuclear weapon test demonstrated the feasibility of making arbitrarily large nuclear devices which could cover vast areas with radioactive fallout by rendering anything around them intensely radioactive, nuclear weapons theorists such as Leo Szilard conceived of a doomsday machine, a massive thermonuclear device surrounded by hundreds of tons of cobalt which, when detonated, would create massive amounts of Cobalt-60, rendering most of the Earth too radioactive to support life. RAND strategist Herman Kahn postulated that Soviet or US nuclear decision makers might choose to build a doomsday machine that would consist of a computer linked to a stockpile of hydrogen bombs, programmed to detonate them all and bathe the planet in nuclear fallout at the signal of an impending nuclear attack from another nation. The doomsday device's theoretical ability to deter nuclear attack is that it would go off automatically without human aid and despite human intervention. Kahn conceded that some planners might see "doomsday machines" as providing a highly credible threat that would dissuade attackers and avoid the dangerous game of brinkmanship caused by the massive retaliation concept which governed US/Soviet nuclear relations in the mid-1950s. However, in his discussion of doomsday machines, Kahn raises the problem of a nuclear-armed nth country triggering a doomsday machine, and states that he didn't advocate that the US acquire a doomsday machine. For many, the scheme epitomized the extremes of the suicidal logic behind the strategy of mutual assured destruction; the idea was famously parodied in the Stanley Kubrick film from 1964, Dr. Strangelove or: How I Learned to Stop Worrying and Love the Bomb. The Dead Hand (or "Perimeter") system built by the Soviet Union during the Cold War has been called a "doomsday machine" due to its fail-deadly design and nuclear capabilities. The film Dr. Strangelove is a satire of the Cold War. In it, the Soviet Ambassador, upon learning that the Americans could not recall a bomber set to deliver nuclear weapons inside the Soviet Union, informs the President that Soviet Premier Kisov had ordered the creation of a doomsday device. The film Doomsday Machine started in 1967 but not released until 1972 featured a Red Chinese doomsday device. In the film WarGames the United States' NORAD created a military supercomputer (WOPR) programmed to predict possible outcomes of nuclear war, intended to eliminate the need for human intervention in missile launch facilities. The conclusion of the movie Beneath the Planet of the Apes implied the detonation of a salted bomb, marked with the Greek letters alpha and omega signifying the "beginning and end", Mutated humans had come to possess it and worshiped it as the weapon of their god. In the James Bond movie Moonraker, Sir Hugo Drax creates a doomsday device – a poison dispersed by satellites – to eradicate all human life on earth. The fictional terraforming projectile known as the "Genesis Device" from Star Trek II: The Wrath of Khan was alleged to be, by the Klingons in the next movie in the franchise's storyline, a "doomsday device" that could be used against any enemy of the United Federation of Planets. Skynet in the Terminator films utilises the United States' stockpile of nuclear weapons in an attempt to end all human life on Earth in an act called Judgment Day. In Star Wars: A New Hope and Return of the Jedi, the Empire has built a massive superweapon called the Death Star capable of destroying an entire planet with its powerful superlaser. In Avengers: Age of Ultron, the villainous sentient android Ultron creates an anti-gravity machine designed to lift the fictional city of Novi Grad, Sokovia up into the atmosphere and slam it back into the Earth in order to replicate an extinction level event meteor strike. In The Bionic Woman, Jaime and a Soviet agent work together to defeat a computer that, ironically, would trigger World War III by a U.S. attack on the computer site. Jaime stops the radio jamming with barely enough time for the B-52 to receive the "abort" signal. In Quatermass and the Pit (1958), in part one a proposition is made by Colonel Breen to police the Earth with Nuclear weapons from an automated system on the Moon, should an aggressor nation wipe out the opponent nation with nuclear weapons they in turn would be destroyed by missiles from space, it was to be known as the dead man's deterrent. In Fringe, a large mechano-organic hybrid device has the ability to destroy universes. In the Star Trek episode "The Doomsday Machine", a conical planet killer goes on a planet destroying rampage. Captain Kirk speculates that the machine was created as a doomsday device, and used, thus destroying its creators and then going on a random path of destruction. A mixed occult/biological form of "doomsday device" was being prepared by Demona for use in the final Gargoyles three-part story arc called "Hunter's Moon", meant to destroy all humanity, but preserve Goliath and the Manhattan Clan, as well as all other living gargates. In Futurama, Professor Farnsworth is known to possess several doomsday devices. In the Simpsons episode "You Only Move Twice", Homer's new boss, Hank Scorpio, is a supervillain who, with Homer's help, develops a doomsday device, and threatens the UN Security Council unless they deliver an unspecified amount of gold within 72 hours. In Sonic SatAM, Dr. Ivo Robotnik made a doomsday device in the series' finale "The Doomsday Project". In Doctor Who there are numerous doomsday weapons, most prominently a device called "The Moment" or alternatively "The Galaxy eater". According to one Time Lord, it is the final work of the ancients of Gallifrey, and the most powerful weapon ever built. The operating system of the weapon was so sophisticated that it became sentient. The Doctor is the only person who ever dared to use it, most notably in his attempt to end the Time War between the Time Lords and the Daleks. The episode The Daleks' Master Plan features a weapon called "The Time Destructor" which works by accelerating or reversing the flow of time and is capable of devastating a planet. The Hand of Omega from Remembrance of the Daleks, a stellar manipulator used by the early Time Lord Omega is capable of making a star go supernova. The malfunctioning superweapon of the planet Uxarieus from Colony in Space continues to poison the planet's ecosystem long after the civilization that created it was destroyed by the device. In the chapter about the Cuban missile crisis of the TV series Secrets of War, a Soviet proposal for a Doomsday Machine is described. It would have consisted of a ship full of fissile material navigating the soviet waters, which would automatically detonate if it detected radiation levels associated with a nuclear attack on soviet territory. This was considered too risky for the Soviet leadership, hence the proposal was not accepted. In the Randy Cunningham: 9th Grade Ninja episode, "Dawn of the Discroll", Jerry Discroll reveals that he built a doomsday device at Mad Scientist University; and in the episode "Night of the Living McFizzles", Viceyroy uses the machine to destroy Norrisville. In the second season of "The Flash", Hunter Zolomon tries to destroy the multiverse using a device called the Magnets. In The 39 Clues: Cahills vs Vespers: Book Six: The Day of Doom, the villain, Damien Vesper, builds a "Machina Fini Mundi," or "Doomsday Device," which reverses the polarity of Earth. Ender's Game features the Molecular Disruption Device (MD Device, "Doctor Device", or "Little Doctor"), which is capable of annihilating an entire planet in one strike. In The Obernewtyn Chronicles the 'Balance of Terror' computer program is designed to prevent global nuclear war by retaliating automatically in the event of an attack, acting as a deterrent. In a 1938/1943 episode of Arch Oboler's radio version of the anthology series Lights Out entitled Oxychloride X, A demented university chemistry student creates a "super-solvent" that can "dissolve ANYTHING! ", and, after breaking into the university chemistry lab, working "illegally" on his new substance, and eventually being confronted by his professor, he states that, among other uses, his new formula has the potential to be used as a potentially Earth-destroying "chemical superweapon" that, in his own words, "would make war itself far too horrible for man to endure!". ↑ Kahn, Herman (1960). On Thermonuclear War. Princeton, NJ, USA: Princeton University Press,. ↑ "Dr. Strangelove's 'Doomsday Machine': It's Real". NPR. ↑ "Gargoyles Wiki - Hunter's Moon Part Three". gargwiki.net. Retrieved April 5, 2013. ↑ "Gargoyles Wiki - Operation Clean Slate". gargwiki.net. Retrieved April 5, 2013. "How to destroy the Earth" – a scientifically rigorous albeit tongue-in-cheek "how-to" guide.